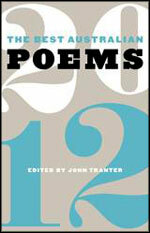 Whatever one may expect from an anthology of contemporary poetry released by a mainstream commercial publisher – an accessible selection of diverse voices and styles, one for both the non-specialist, general reader as well as the (less snobbish) connoisseur, a selection featuring promising emerging writers as well as more prominent authors, and so on – Black Inc. Publishing’s annual Best Australian Poems Series has been meeting these expectations, more or less consistently, for close to a decade. And despite the series’ many specific strengths and few weaknesses, the latest addition to the series follows the same general tradition successfully. In the interest of transparency – something that, in my opinion, our poetry communities could do with more of – I should declare at the outset of what will be a mostly positive review, that I was fortunate enough to have a piece of my own featured in this volume. This is not, however, the most positive aspect of this book for me. John Tranter’s selection includes not only some of my favourite poets – some of whom I’m pleased to call friends, a statement that I make also in the interest of transparency – but it also includes many wonderful poets whose works I have not read before. I’d like to start by briefly exploring two of the stronger poems in the anthology. I’m thrilled to see Felicity Plunkett’s ‘Confetti by Dada’ (first published in Island) included here. If an anthology of contemporary writing is to exhibit the genuinely contemporary – as opposed to formulaic lyrical/experimental poems that mimic the established lyrical/experimental modes – then Tranter’s selection succeeds by including such perspicuous examples of an exciting, new poetics. lips, adore, golden, dark, I. The ‘I’ emerging at the end of this stanza is clearly not the egoistic, Romantic and much-maligned lyrical I – it is instead an undecidable agent produced by a process of ‘cutting’, ‘opening’ and ‘shaking’ – but it is, nevertheless, an ‘I’: the mark of a subject who speaks for the truth of the event of her being. Interestingly, Plunkett’s poem ends with a subtle rephrasing of the last line of Tzara’s original manifesto, with Tzara’s ‘I consider myself very likeable’ rewritten in Plunkett’s poem as (with my added emphasis): ‘I still consider myself / very likeable’. What this fascinating paraphrase suggests is that while the contemporary Australian poet is keen to pay an intertextual homage to the early 20s century Romanian avant-gardist, she is also stating that her fidelity to the event of Dadaism is conditioned by a historical distance – she is ‘still’ quoting Tzara – and that an affirmation of the poet’s contingent ‘self’, as highlighted by the inserted enjambment, is precisely what this distance necessitates. This entry was posted in BOOK REVIEWS and tagged Ali Alizadeh, Felicity Plunkett, Jessica L. Wilkinson, john tranter. Bookmark the permalink.